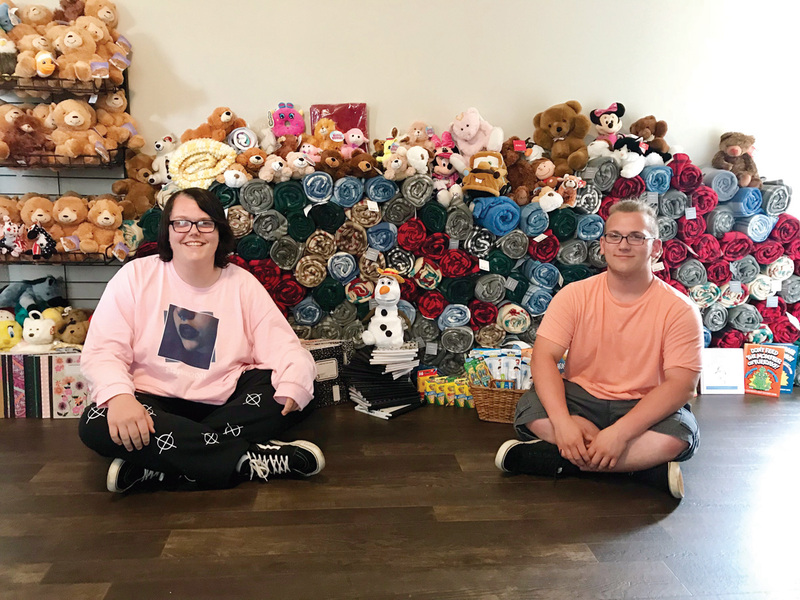 Sam Riggins and Thomas Blackiston sit in front of all the items donated to Kind to Kids. Thomas Blackiston is a rising senior at Indian River High School, and Sam Riggins is a rising junior at Indian River High School. When each was in the ninth grade, they and about five other Indian River students learned they were the lucky recipients of a Give Back college scholarship. The Give Something Back Foundation (Give Back) is a scholarship and mentoring program for lower-income (Pell Grant eligible), academically-proven students who have faced adversity. The program starts for accepted scholars in the ninth grade and works with them through college graduation. Tuition, fees and room and board are all included. According to Give Back, 36 million Americans of all economic classes started college but never graduated. Some ran out of money, and others were not given the necessary tools to succeed before arriving on campus. Give Back’s goal is to prevent that from happening. Thus far, the foundation has pre-paid for more than 1,000 students to go to college debt-free. Their partner university in Delaware is the University of Delaware in Newark. Blackiston’s mom, Cindy Stinger, a “lunch lady” at East Millsboro Elementary School, was over the moon with excitement when she got the news. Tommy will be the first college graduate in her family — no doubt about it! There was similar excitement in Sam Riggins’ house, except — to his mom, Devon McGee’s dismay — she wasn’t home when the letter arrived. “I really had wanted to see his face when he got the news,” she said. “I was super-excited and thankful when I read I got the scholarship,” said Riggins. “I called Mom and then my grandparents right away. Now I’ll be able to study music production in college and live my dream.” Riggins noted he and Blackiston both play in the Indian River marching band — he plays trumpet, and Blackiston plays tenor saxophone. Steele indicated that the focus of the scholarships does change each year. For this year’s freshman class, Give Back prioritized children with an incarcerated parent. At other times, children living in foster homes and meeting the academic requirements have been preferentially selected. “It is an amazing opportunity for those eligible in that particular year,” Steele said. The charitable project for the Give Back scholars this spring was the My Blue Duffel program, which is part of the Kind to Kids Foundation. Since 2011, Kind to Kids has offered love, hope, guidance and a sense of stability to 12,000 vulnerable children in Delaware — those who are abused, neglected, impoverished and living in foster care. My Blue Duffel provides emergency care packages for abused children, thus easing the painful transition to foster care with comforting supplies. Many local businesses, as well as family and friends, contributed. They included D.B. Fries in Bethany, where Blackiston is working for a second summer; Integrity Builders East, owned by Riggins’ grandfather; High Tide Church; VFW Post 7234 in Ocean View; Roxana Volunteer Fire Company and its Ladies Auxiliary; and East Millsboro Elementary School. Both moms were actively involved in the project. “We were really lucky, because Kmart was having a sale on blankets and we caused them to sell out!” said McGee. “At this point, the boys have collected a good mix of things, but we would love to have more donations of books, or money to buy them — especially for older kids.” McGee’s living room wall is already neatly stocked with 565 separate items. The essay the boys had to write as part of their scholarship application was to be about someone who they looked up to. Both Tommy and Sam immediately responded “my mom” when asked who they wrote about. Both boys, as well as the other Indian River Give Back scholars, are looking forward to spending a couple of days at the University of Delaware in July. To learn more about both causes, go to www.giveback.ngo and www.kindtokids.org.